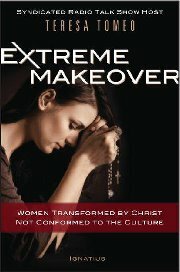 Teresa Tomeo has a new book — Extreme Makeover. It is for girls. I have a bunch of girls! I am a lucky man! I have a beautiful wife, three gorgeous daughters and four princess granddaughters, not to mention my 90 year old mother who is still full of life, modesty and humor. Guys are not crazy about girly makeover things. I know because my son and I usually leave the house when my wife and daughters get out the mud masks and skin creams. But we won’t leave the house when the girls begin this makeover! Real men love feminine, moral and modest women. I’ve been married to one for 36 years – one who practices what Teresa teaches (and what she also practices). My wife has constantly won my heart day-after-day. Bravo Teresa for a much needed and very informative and practical book! Check out the Extreme Makeover Facebook page. You should probably get a copy for the girl you love!